I was excited to be asked by a business publication to take a portrait of Jeannette Balleza Collins. Excited because she is not only an awesome person, but she’s a long-time friend. Jeannette and I went to high school together and our paths have continually crossed during the last 20 years. It seems like we mostly run into each other when we are working, and I am always amazed by everything she is doing. For the portrait, I wanted to do more than photograph her in her environment. I wanted to do something creative because I felt like it fit her personality… and I knew Jeannette would be up for anything I threw her way. 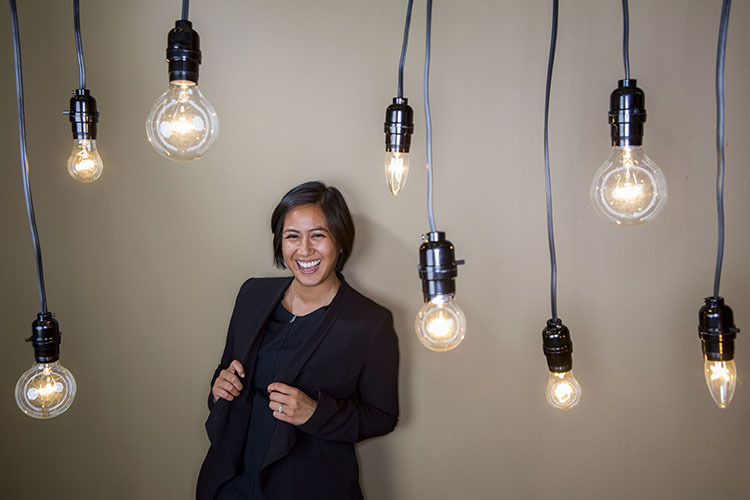 I came up with the idea to surround her with light bulbs because of her work with start-up companies. I wanted to show that she was surrounded by bright ideas. I started to research images and realized that I would have to get my hands dirty and build something if I wanted to make the idea that was in my head come out in print. I used my knowledge from hard-wiring lights at college basketball games and started building. I had to attach the light sockets to a cord, and then add a plug. I was a little nervous because I’ve never actually used electricity in anything I’ve wired, but luckily I didn’t burn anything down! I think my child was entertained as he manned the fire extinguisher when I plugged in the first light. 10 lights later, I drilled holes in the end of a board and mounted it on my background stands. I used hooks and clamps to attach the lights to the board, and took care to notice the spacing of the bulbs. I didn’t build the prettiest set, but it worked! My initial idea was to shoot straight on with a ring flash. I was liking the image, but it still just didn’t feel right. I decided to try to shoot wide and have the lights in the foreground. I had Jeannette lean against the wall, and her fun personality began to shine. I made adjustments to the lights, and ended up using the ring flash off camera. I love it’s round reflection in the light bulbs. I had a lot of fun with the photo shoot. I really enjoyed the freedom and creativity, but most of all I enjoyed working with my friend. You can read about Jeannette in this month’s issue of Arkansas Money & Politics. Hey! I grew up across the street from her! I used to play with her and her sister. Awesome photos! I love the light bulbs. Thank you. It was a fun photo shoot!